Okay, at last…this will be my first attempt of posting some video that I shot of my garden last month and hopefully I won’t mess things up here and I will do it correctly without too much trauma. My garden is constantly changing each day and for a while, we had some very warm weather that triggered many plants to bloom too soon. Then we became swamped in several rainstorms and then after that, the temperatures dropped so low that we had even a wee bit of snow. Needless to say, all of these weather changes have caused confusion for not only my garden but for all kinds of plants and crops. The good news for farmers who grow stone fruits, is that at least the cold weather would be good for their production but for plants that have bloomed out of their normal cycle, it could be damaging. But, I guess I don’t really know. 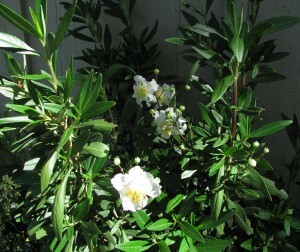 However for my garden that is filled with native plants from California, there’s been quite a bit of confusion, lately. Bulbs were coming up and as a matter of fact some of the native Irises in my garden were sending out shoots, but not now. Frost in the mornings put an end to that attempt to show off. But more on that in a later post because I want to see if I can manage to a share a video that I did at the end of February of the garden. 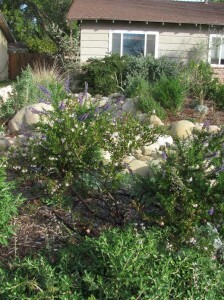 At that time the Ceanothus and Monkey Flowers were blooming and so was the Howard McMinn manzanita. Plus, there is a brief appearance of Theo, too! Note his beautiful blue eyes…and his jaunty harness! 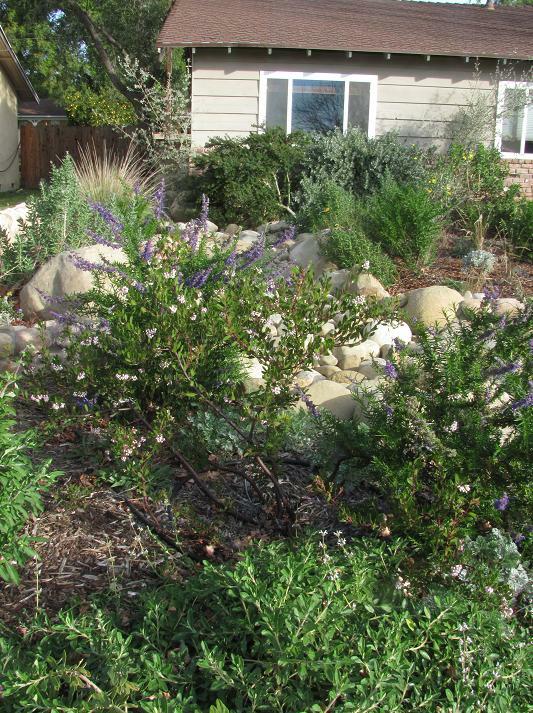 The manzanita’s flowers have since turned brown because of the freezing temperatures but the Ceanothus, Monkey Flowers, Channel Island Poppies, continue to bloom. And there are even a few California Poppies starting to put on their show. Well, it seems that I can’t load the video, because it exceeds the allowable size for my web site. Drat! Back to the drawing board, but I will learn how to do this. 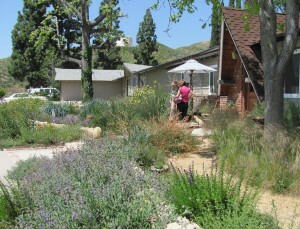 Two weeks ago my garden was part of a Spring garden tour for the Simi Valley – Moorpark Republican Women’s Club. 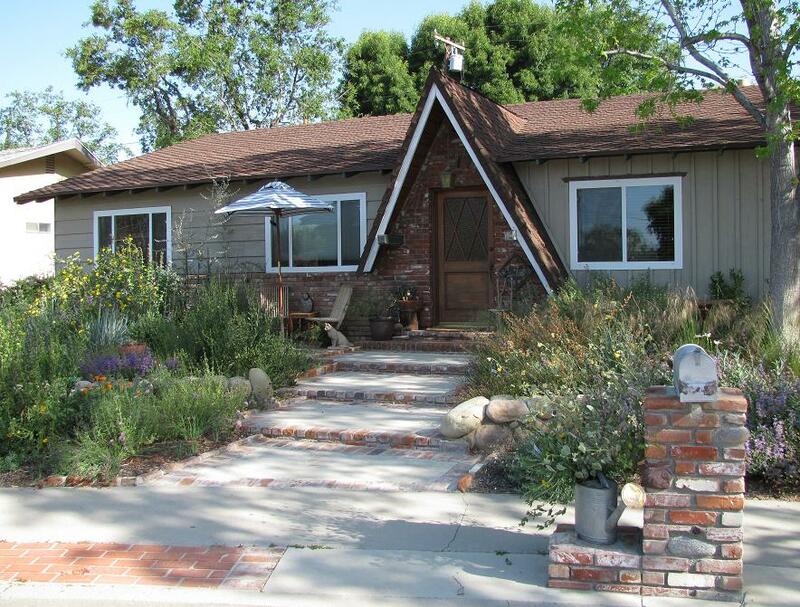 There were a total of five featured properties but mine was the only one dedicated to California Native plants. 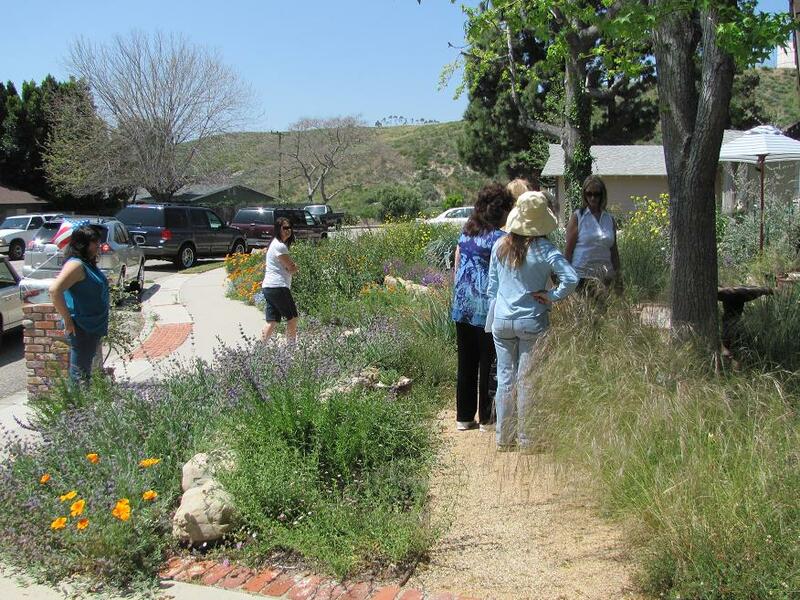 The members were all surprised to see what a native garden looks like and how beautiful one can be and they had quite a few questions about it. The press release didn’t say that one of the gardens on the tour would be a native one and I am betting that if it had, there would have been even a larger amount of visitors on the tour, although I am guessing that there was probably about 200 or so that came to my home. I had a table with several selected books about native plants and landscaping with them, plus several handouts as to where to find them and other resources as well. My two hostess from the “Club” said that most of the time when they do these tours, the owners aren’t home and they expected to be very bored but I kept them busy! 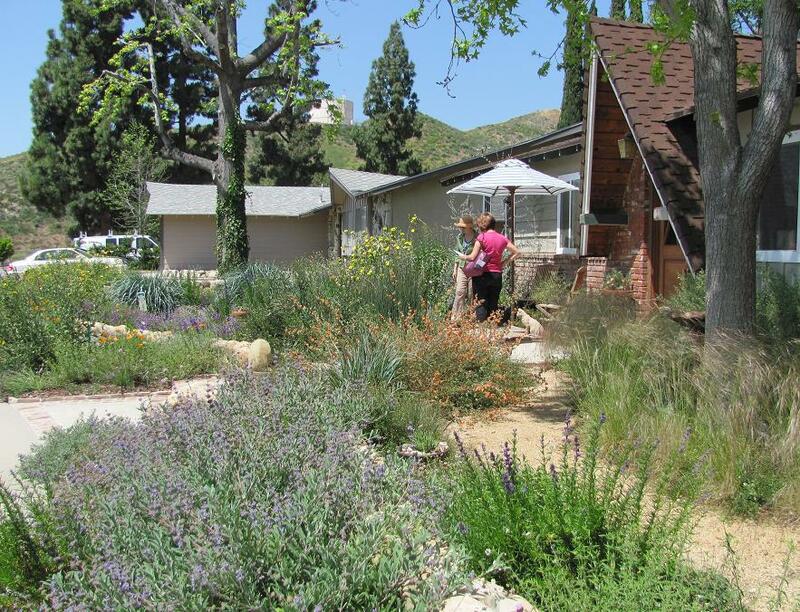 Soon they were saying to the visitors that “This is a 100% California native plant garden”…and they had a blast mingling with the visitors and hanging out with me and at the end of the day, they both said it was the most fun they have ever had hosting! Most people wanted to know how often I watered the garden and needless to say thay had many questions about the plants. Where could they get them? What’s it called? (Even though I had tags next to most of them) and how much work is it to take care of? I felt like it was some sort of celebrity all day long. The questions kept coming and I rarely sat down for a break. But it was fun and I felt really happy about all the interest the garden got and also how thrilled and excited people were to mingle in it. The smells, the textures, the colors and birds all lended magic to each visitor’s experience. At the end of the day, I was quite tired after answering so many questions but at the same time, excited by all the interest. I think my garden made a huge impact on the visitors and changed their conception of what a garden can look like using only natives. Later I poured myself a glass of wine and sat back under my new umbrella to relax and enjoy the twilight of the evening. And believe it or not, some people still dropped by, bringing their spouses to see the “wildness”…and admire it just a little bit more. 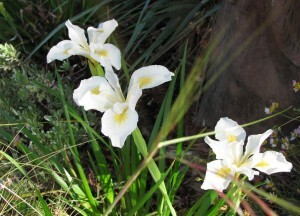 California native Iris in my garden. As of late, I have been so busy with what seems like a million projects going on all at the same time, that my mind is scattered and unfocused. 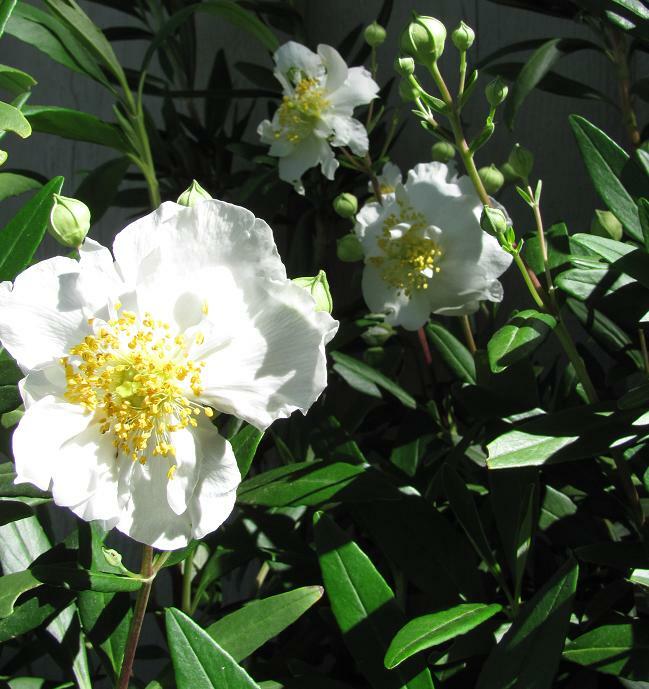 But my garden is spectacular, fragrant, lovely, filled with birds, butterflies, fragrance and life. And a place to retreat to with a glass of wine when I feel overwhelmed. And each one of these comments is a discussion onto itself. Everything seems to be blooming and with the amount of rain we have had this winter and Spring, all the plants have grown quite a bit. Some are quite large, as a matter of fact. I am eye-balling the Canyon Prince Rye Grass, realizing that they are going to become too big in some of the spots where they are currently growing and I will be digging some up this winter. Going on The Theodore Payne Foundation Native Plant & Wildflower garden tour this past weekend, was wonderful. I saw some terrific designs, some that were just “okay” but the passion and enthusiasm of the hosts was lovely. 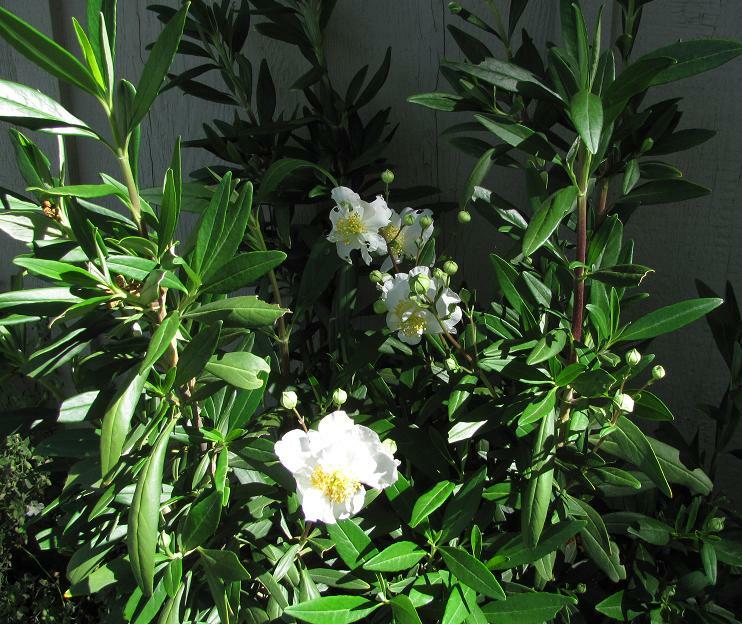 And I took note of some of the plants that I happen to have in my garden and realized there were be a potential problem in the future if I don’t remove them this winter. I am guilty of putting in too many plants and too close together and now I will have to rectify that before it becomes a major job. But, I love my garden. It’s beautiful, tranquil and filled with life. And it will be on a garden tour this Sunday. I am told to expect about 300 people, all of who are traditional gardeners. 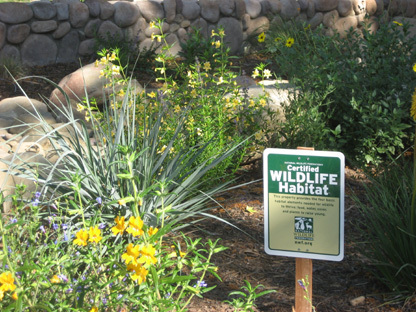 So my garden will be a new experience for them and I am expecting many questions about native plants.